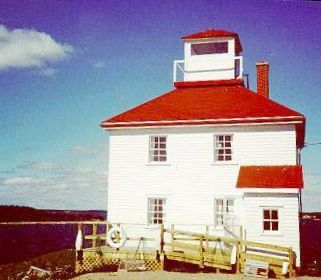 For visitor's information, go to Port Bickerton Lighthouse . Lighthouse History Contributor: Kathy Brown. Photographs: Dan Conlin and Nova Scotia Lighthouse Interpretive Centre. Sources: Nova Scotia Lighthouse Interpretive Centre. The current light tower is a square while concrete building. In the foreground is the reconstructed second light which is now a lighthouse interpretive centre. The current operational lighthouse is in the background. Bickerton was settled in 1840 by a group of fishermen from Peggy's Cove. 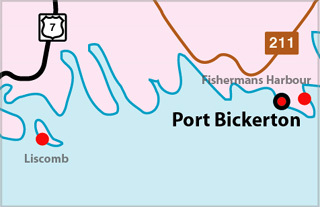 Although Bickerton Island was settled first, the area surrounding the lighthouse was settled soon afterwards. 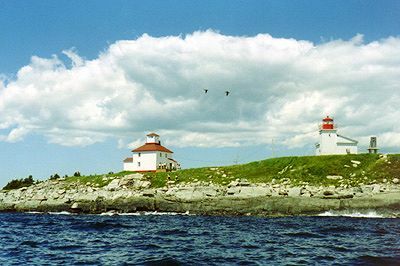 It was not until 1901 that the first of three lighthouses was constructed in Port Bickerton. Emery Taylor of Stillwater, N.S. was contracted to build the lighthouse with a bid of only five hundred dollars. The lighthouse was completed in January of 1901, but it was not operational until October 10th of the same year. The lighthouse was a small harbour light, housed in a square, wooden tower, painted white with sloping sides. 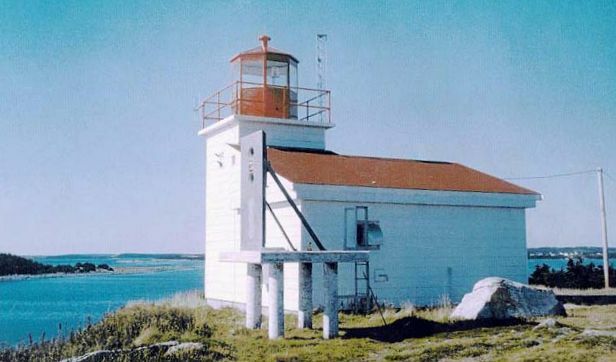 The western region of Barachois Head was home to this first lighthouse. It was erected one hundred feet from the shore, on a site twenty-five feet above the high tide line In clear weather it was visible for seven miles. The first lighthouse keeper was Theodore O'Hara. His yearly salary was one hundred and fifty dollars. Until the first residence was completed in March of 1903, he had to row back and forth to the light from the village across the harbour. Keepers were not well paid. In the 1940's they were paid only nineteen dollars each month. Irvin Beiswanger had to fish lobster as well as keep the light in order to earn a living. A fire in the district in 1947 brought the lighthouse dangerously close to destruction. The blaze started across the peninsula in Fisherman's Harbour and worked its way to the light. Fortunately, residents in the community were able to douse the fire with water from the sea. The light escaped destruction with only some damage to the roof. Until 1948, the fog warning device consisted of a small, manually operated fog horn and was utilized only when boats were entering the harbour. Electricity was introduced to the Port Bickerton area in December 1947, and along with it came an automatic fog horn. The first automatic horn sounded from the Port Bickerton light October 20, 1948. Now on top of ensuring that the light itself remained lit, the keepers also had to start the engine for the fog horn. They were responsible, as well, for relaying the weather over a two-way radio. In 1962 the light was converted to electricity. Up until that time oil had been used. Fire at the Bickerton Light. One substantial area of concern associated with the timber buildings on lightstations was that of fire. In 1962 the Port Bickerton fog alarm building was destroyed by a fire. The fire started when the assistant lighthouse keeper tried to remove paint from the floor of the fog alarm building with a blow torch. It is believed that the torch ignited oil which had seeped through the floor, making the fire impossible to extinguish. The light keeper and his assistant removed the fog alarm engine, stove, and other minor pieces of equipment so the tanks, only were lost. The building itself was damaged beyond repair. The fire did not spread to the other buildings on the station because of the quick thinking of the keeper's wife. She went immediately to Bickerton by car and brought out a small pump and several men from the village. The men used the pump to hose the assistant's dwelling and also to contain the fire in the fog alarm building. The concrete tower at Port Bickerton with the second lighthouse in the background. Soon after the fire, K.C.Curren, Superintendent of Lights, along with marine mechanic A.Shortt went to the Bickerton light to investigate the matter. The recommendation was made to provide light stations with a gas driven fire pump. As a result of the visit of Curren and Shortt, a combined fog alarm building and light tower of concrete were constructed. This was the third light built at Bickerton, and it still stands today. The concrete light is still in operation. The second lighthouse has been restored and is open to the public as The Nova Scotia Lighthouse Interpretive Centre. Port Bickerton, on the Eastern Shore of Nova Scotia. The lighthouses stand dramatically on a bluff at the end of the headland. 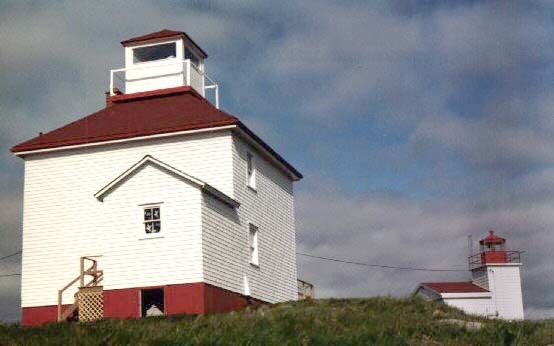 The second lighthouse has been restored and houses the Nova Scotia Lighthouse Interpretive Centre.